It's never easy to say goodbye. The godfathers of thrash metal, Slayer were burdened with the task of sending out their final wave goodbye to the Edmonton fans who packed the Shaw Conference Centre to give the historic group a memorable sendoff. Slayer would give concert goers one more night of memories in the best way they knew how — with an unrelenting and unhinged metal show. Accompanied by a stacked lineup of influential metal performers, Slayer rallied the best in the business to aid in making the night momentous, recruiting polish metalers Behemoth and known tour companions Testament, Anthrax and Lamb of God. Each group played a key role in setting the tone for the mayhem that would ensue once Slayer took to the stage. Direct to the task at hand, Slayer sparked their performance by entering to "Delusions of Savior," the prelude to "Repentless," from their most recent effort. Slayer delivered their chaotic and ruthless brand of metal in the fashion the group have become known for, tearing through song after song without so much as moment's pause between. Weathered, and perhaps road worn, frontman Tom Araya at times looked like his mind was elsewhere during the set. The seemingly fatigued frontman still demonstrated his professionalism by belting out each song, not surrendering any quality in his vocals and staying focused on the task at hand. Araya rarely addressed the audience, instead giving his energy to screaming his songs with as much power as possible. Despite being the most recent addition to the group since the untimely death of founding member Jeff Hanneman, guitarist Gary Holt has come into his own with the group over the past years and proved to be the largest factor for Slayer's on-stage energy. Not afraid to explore the real estate on stage, Holt flailed his guitar around his body and over his head while conjuring expert solos and exhibiting his masterful musicianship. Performing a set list that spanned the groups discography, playing songs like "Black Magic" from their debut and "Show No Mercy" and "Payback," from the extra-controversial album, God Hates Us All. 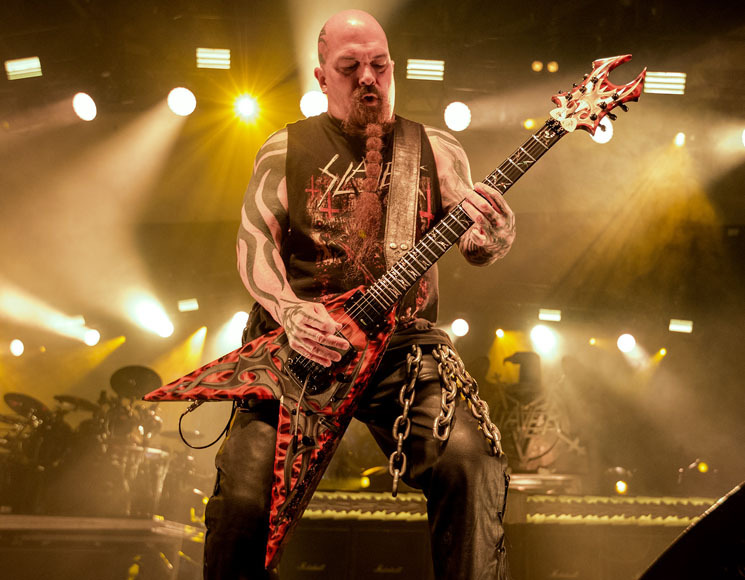 Guitarist Kerry King and drummer Paul Bostaph led the charge in showcasing the group's endurance, laying down a foundation for the performance to build from. Slayer validated again that despite touring for almost three decades, there's no competition when it comes to the stamina the group display. As is the case with most of their shows, Slayer finished with "Angel of Death." Seen as gods by many, the last "thank you" from Araya would show the mortality and vulnerability of one the most badass and rugged frontmen to take the stage. With a catch in his voice, Araya spoke softly: "I don't know what else to say, other than thank you. Thank you for everything." For those in attendance, the show was bittersweet and a hard pill to swallow. Chants of the bands name rang throughout the venue, as fans were returning Araya's sentiment; Thank you, Slayer.